The Amano MJR-7000 is the unrivaled champion of calculating time clocks. 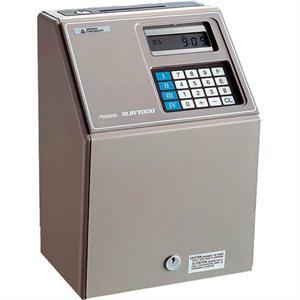 This clock is a reliable time clock that does the calculations for you, also separating overtime hours, saving you time and mistakes during your payroll process. It's durable steel case, steel frame and superior electronics and design make this a workhorse among all time clocks, suitable for companies of all sizes and environments. The MJR-7000 accommodates up to 100 employees and has features and a track record of reliability no other time totalizing time recorder can match. The clock uses the special numeric timecards with a series of 0 to 99 to track the hours (can be programmed to use other numbers, but only up to 100 in sequence).